The artist recalls as a young boy walking along the beach with his friends. Early mornings, on the incoming tide (Arapka) they would observe, out in the lagoon, fish tails sticking out of the water. These belonged to the trevally who were feeding on worms and sea grass pods called Nara. Their tails moved along with the tide, which, when seen from a distance, the artist likened to the sails of a canoe. 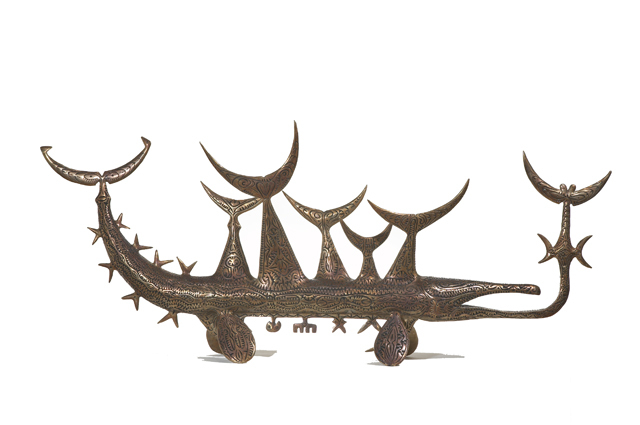 In this sculpture the artist has depicted the tails connected to a Long Tom (Baiyag), a surface dwelling fish, which he has used to represent the canoes and their sails. The shapes beneath the belly of the Long Tom represent the seed pods and worms on which the trevally feed. There are different markings on each side of the body of the Long Tom which represent the different currents experienced in the lagoon. The ones on the right hand side represent the Kulis or strong current of the incoming tide on which the trevally feed. The markings on the left hand side represent the Gutath or weak current of the outgoing tide. The eyes of the trevally are shown on their tails. The reason for this is because they are an extremely sensitive fish that will scare if they detect they are being approached. There are traditional island songs that celebrate the sailing tails of the trevally.